Abhishek Chaubey’s Sonchiriya is a quest for freedom for the dacoits of Chambal and a unique experience for Bollywood audience . In a week largely dictated by talks of war between India and Pakistan, Abhishek Chaubey’s Sonchiriya turns its lens to look at a ‘war’ within — between the dacoits in the hinterland of Chambal ravines and the government. The film, which gets all-round brilliant performances from its cast of Sushant Singh Rajput, Ranvir Shorey, Bhumi Pednekar, Manoj Bajpayee and Ashutosh Rana, however, takes a different stride from the usual bullet-driven bandit films to instead focus on the inner turmoil of the members of a gang nearing its doom. Director Abhishek Chaubey, who started out as an assistant to Vishal Bhardwaj, showed his prowess in depicting rural India in Ishqiya (2010). 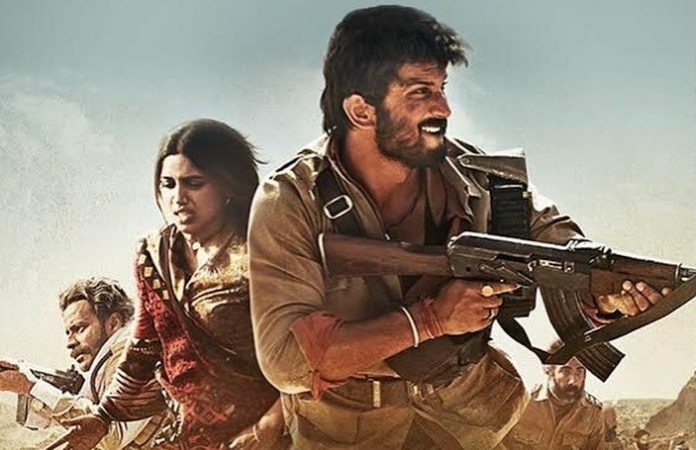 With Sonchiriya, he notches up something even better as the film’s wide Chambal landscapes sync perfectly with the Bundelkhandi dialect of Indumati Tomar (played by Bhumi Pednekar), a woman who fled her family, and of gang member Vakil Singh (Ranvir Shorey). (I was thankful for the subtitles!). Sushant Singh Rajput as Lakhan aces his role, with some minor slips along the way — his long eyelashes sometimes fail to hold the angst and menace of his character, especially in frames with Pednekar and Shorey. Pednekar comfortably slips into Indumati’s determination to live and seek justice, and Shorey’s Vakil is a fitting tribute to the actor’s true potential, which director Chaubey would have realised while producing him in A Death In The Gunj (2016). Among other characters filing up the canvas is Ashutosh Rana’s Inspector ‘Gujjar’ Virendra Singh, who is tasked with cleaning Chambal of the dacoits and is after Maan Singh and his gang members. He is supported by his two sub-inspectors, both so-called upper caste Thakurs, who philosophise every incident around them — when they are not commenting on the shame of having to work under a Gujjar. Their placement reminds you of the two sub-inspectors from Vishal Bhardwaj’s Maqbool (2003), a film Chaubey worked in as an assistant director. The movie is replete with motifs that may fail to get registered in the first instance. The film is set in 1970s, and covers the period, as well as the day, when the Emergency was declared. So, while the former Prime Minister Indira Gandhi’s announcement of the Emergency can be heard on the radio in one scene, a child running with a pinwheel with Gandhi’s picture on it can be seen in another. Chaubey’s previous films — from the Ishqiya series and Udta Punjab (2016) that he directed to the ones he assisted Vishal Bhardwaj with (or wrote stories of) — have all had a depth in their narrative. Sonchiriya further builds on to his repertoire and, in many ways, far supersedes his previously acclaimed works. Anuj Dhawan’s cinematography magnificently captures the dust, sweat and grit of Chambal in every frame. If you don’t let the slow pace of the film get to you, then you will be left mulling the multi-facets of the film long after you walk away from the theatre. However, the characters are not without their own contradictions. They keep telling us that they are performing a ‘baaghi’s dharma’ but can’t seem to explain clearly what it is, just like we are never given any justification for why they loot and plunder. But their ‘dharma’ keeps changing like the topography of Chambal, from taking revenge to not killing women and children to delivering justice. In their flight across the ravines of Chambal, Sudip Sharma’s screenplay tugs on patriarchy, masculinity, caste and gender. Phuliya, based on infamous Chambal dacoit Phoolan Devi, tells Indumati – ‘Brahmins, Kshatriyas, Shudras and others are castes meant for men; the caste of women is a different one altogether, one that is below all of them’. Sonichiriya goes down as a deep reflection of souls looking for freedom in the ravines. The doomed future of its characters looms as the larger narrative as they dodge bullets from the police and the rival gangs. The film offers an experience that has become so rare in Bollywood.